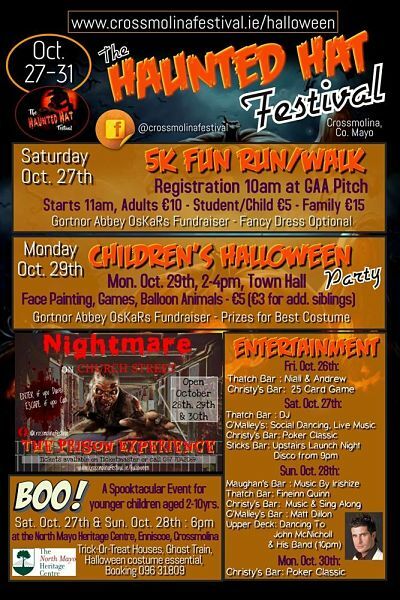 It’s Halloween 2018, and the hellish Haunted Hat Festival makes a return to Crossmolina from Sunday 28th to Tuesday 30th October. Nightmare on Church Street – Part II will once again be the highlight of this petrifying programme of events, and the inmates of THE CHURCH STREET SLAMMER have taken control of the prison. Will you be their next victim, and find yourself locked in a cell with only a notorious escape route that will take through part of the prison no normal human being dares to roam? Will you manage to keep up with your group or will you become separated, left to the mercy of these dastardly souls? Who do you trust as you make your way through the creepy corridors? The “friendly” prison guards, or the evil inmates? Do you have what it takes to make it through? Tickets go on sale on Monday October 1st through Ticketmaster or by calling the Festival direct on 087 704 2069. This event sold out in 2017, so early booking is advisable. Tickets are priced at €5 each + booking fee. PLEASE NOTE: This attraction is not suitable for persons under 12 years, or those that suffer from certain medical conditions such as epilepsy. A full list of FAQs is here and we recommend that you take a read before booking. 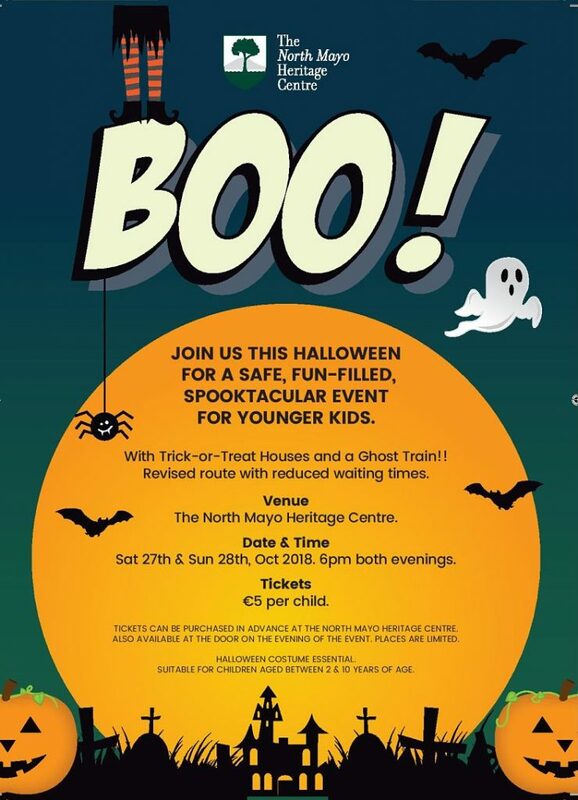 Aimed at younger children up to 10 years old, ‘Boo!’ at the North Mayo Heritage Centre at Enniscoe is two fun-filled evenings on Saturday November 27th and Sunday November 28th with trick or treat houses and a ghost train!